Landscape+Urbanism: A Trio of Bikes = A Tricycle? A couple of landscape-related bicycle designs encompassing the crossover potential for design into transportation and even ecology. 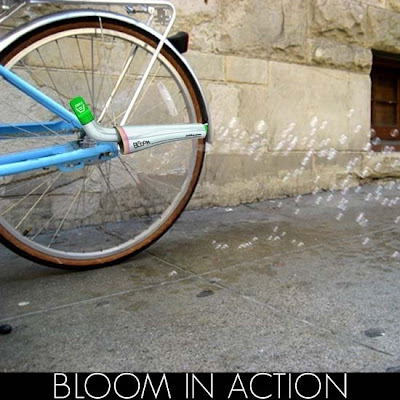 One of the winners of the competition for the competition results for the Design 21: Power to the Pedal contest is entitled Bloom : peddling green by Society Creative llc. 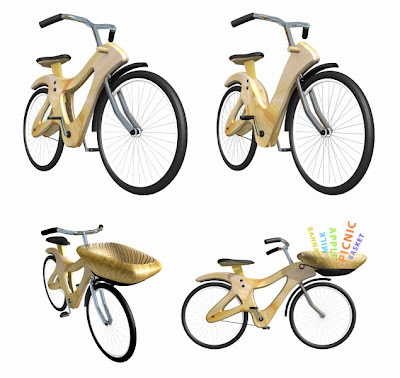 Designers Matthew Boyko, Christina Ng envision a bike-mounted system that can subversively revegetate areas on the go. The statement from the submittal: "The Bloom device is meant to be a subversive and inspirational tool for our concrete jungles. 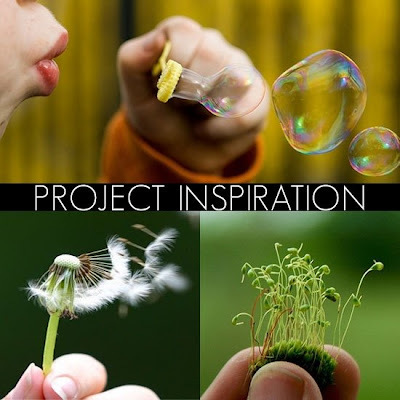 Similar to the tuft of a dandelion as the wind carries the seedling, we propose a way of dispersing seedlings with bubbles and bicycling. 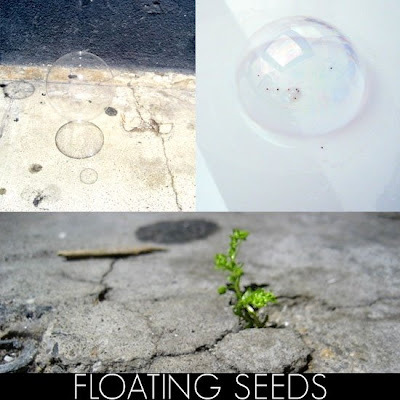 Seeds are co-mingled with a bubble mixture and upon pedaling to your destination , you release the floating seeds which land in cracks and crevices throughout the city streets." Continuing: "Over time, the seeds grow into flowers and plants to create a green "fringe" to our sidewalks and streets. Using natural ingredients; vegetable based soap and seeds, combine together to make a dissolving "nugget". The resulting mixture resides in a reservoir inside Blooms aluminum housing. The housing is attached to the lower frame near the rear tire, similar to a exhaust pipe. 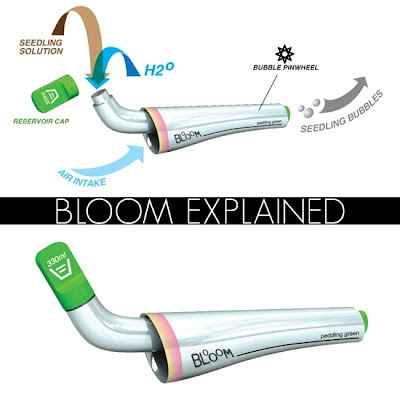 Upon pedalling, air enters the front of Bloom and spins a pinwheel inside which picks up a small drop of the seed/bubble mixture and blows a bubble carrying a seed out the back as "exhaust". Finally: "Our inspiration comes from the tale of Johnny Appleseed, where he would spread seeds everywhere he went planting apple trees for future generations." 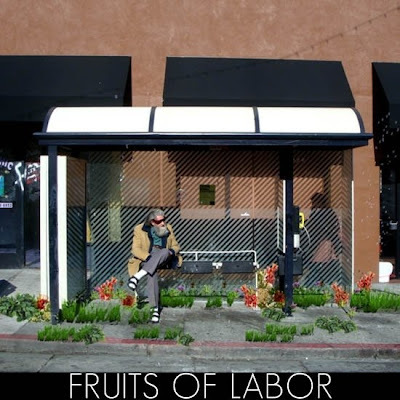 Perhaps they should read up on the fruits of Johnny Appleseed's labor - although vegetation in the form of booze is not to be scoffed at (and the guy at the bus stop would probably agree). Whatever it takes... we will revegetate the world. I think of the significant bike traffic in Portland, and how the bike routes would have a leafy quality to denote them as different from other spots in the city... now that's a bike boulevard. From Dwell - the bikes are not there yet, but a fleet of bikes are already available: "Governors Island, the former Coast Guard Base off the southern tip of Manhattan, is offering 250 bicycles for rent, all of which are free on Friday. 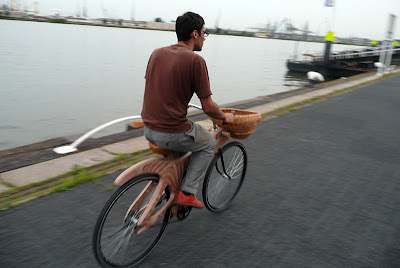 Next week a prototype of a wood-frame bike by Rotterdam designer Adriaan Geuze, will go on display. Geuze’s landscape firm, West 8, is part of a team remaking the 172-acre island into a park with hills and marshes. 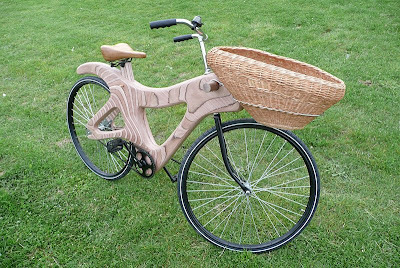 "Three thousand free wooden bikes would allow for rapid circumnavigation on looping, leafy paths," their proposal said. The bikes will be hard to steal, since visitors come and go by ferry." 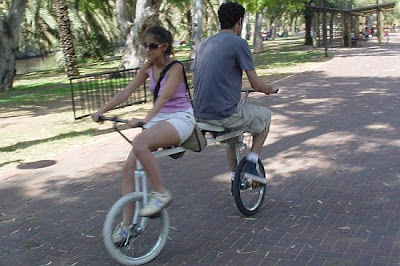 The final version is more social experiment than real transportation, but a very odd twist on a bicycle built for two - is the trust-building Bi-Cycle Tandem by My Atomic Mass, seen via The Design Blog: "The tandem bike allows both the riders to contribute equally to the riding (and crashing?) experience by letting both of them steer and peal at the same time. Of course the exercise demands an inhuman amount of trust between the two riders which I’m guessing can be found only amongst members of the circus." Sounds like fun.